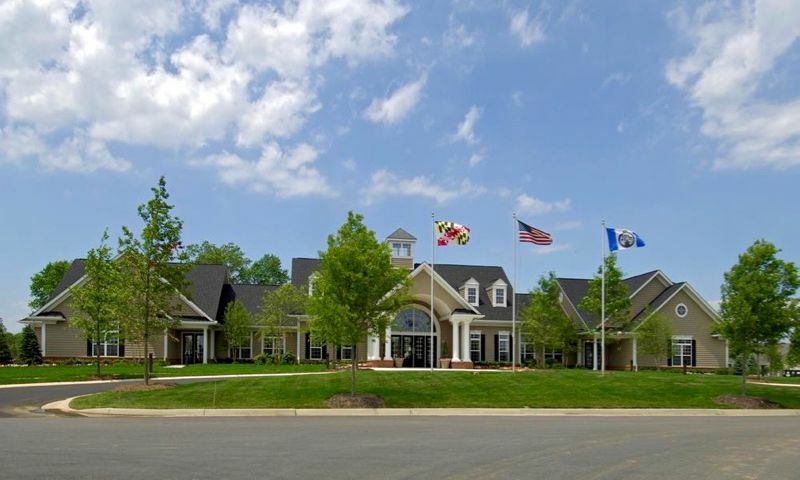 Symphony Village is an award-winning active adult community with quality-crafted homes, located 18 miles from Maryland's scenic Bay Bridge in the charming town of Centreville. Symphony Village is close to Chestertown, Kent Island, Easton, St. Michael's and the Delmarva Peninsula beaches. In addition to a great location, the 395 open and airy single-family residences designed around main-level living with the finest in luxury appointments will make Symphony Village a discerning, yet personable community for active retirees. At 13,800 square feet, the Symphony Club offers amenities one would expect to see in a much larger community. To stay in shape, the Symphony Club provides a state-of-the-art fitness center, aerobics and dance studio, and an indoor pool. For socializing there is a grand ballroom, grand music room, and for hobby pursuits there are several activity rooms. A billiards room, library, and cafe round out the indoor amenities at Symphony Village in Centreville. Outdoors, two tennis courts, three bocce ball courts, and walking trails provide fun options for exercise. Symphony Village residents can also get together over a friendly game of badminton or horseshoes, and relax in the sparkling outdoor pool or patio. There is even a tranquil community flower garden, and for the grandkids there is a playground. Residents can also practice on the putting green before heading out to an area golf course. Construction of Symphony Village at Centreville started in 2003. The builder, Caruso Homes, offers single-family homes in many floor plans with numerous options. There are 13 models to choose from that offer 1,401 to 3,320 square feet of living space. These single-family homes have two to four bedrooms, two to four bathrooms, and an attached two-car garage. Some personalization options include lofts, sunrooms, fireplaces, and finished basements. All homes include dual walk-in closets, oak cabinets in the kitchens, and tiled bathrooms. Residents of Symphony Village in Centreville enjoy a year-round vacation lifestyle in the desirable Chesapeake Bay region within reach of the nation's capitol area. This beautifully maintained community is just the right size for active retirees who want a community that is not impersonal. A full-time activities director is on hand to plan many fun and social events throughout the year. Regular club meetings also take place at Symphony Village. Active clubs and activities include bridge, Mah Jongg, canasta, poker, rumba dance, biking group, knitting, and dozens more. Centreville is ideally situated between the Delmarva beaches, the Kent Narrows and Annapolis. It is also home to the Native Shore Hunting Preserve and the Museum of Eastern Shore Life. Annapolis is about 30 minutes away from Symphony Village and offers a large variety of dining, shopping, and cultural attractions. Some of the places worth visiting are the U.S. Naval Academy Museum, Annapolis Summer Garden Theater, William Paca Garden, ARTFX Gallery of Fine Arts and Crafts, and the Annapolis Marine Art Gallery. Annapolis also has an airport, which makes long-distance travel convenient. Symphony Village in Centreville, MD is a wonderful 55+ community for today's active adult homebuyer in the Easton area. The Symphony Club - 13,800 Sq. Ft. There are plenty of activities available in Symphony Village. Here is a sample of some of the clubs, activities and classes offered here. Homebuyers can purchase a new or resale home in Symphony Village. There are 13 models to choose from that offer 1,401 to 3,320 square feet of living space. These single-family homes have two to four bedrooms, two to four bathrooms, and an attached two-car garage. Homes can be customized with a variety of options to meet buyers styles. Active adult community with many amenities including large clubhouse, indoor and outdoor pool and jacuzzi, tennis courts, putting green, bbq pavilion, bochie ball, horseshoe pits, gazebo and three ponds surrounded by bike and walking paths and lots of common green space. Lots of planned activities and friendly, caring neighbors. This is really a wonderful place to call home! Here are some of our favorites ... the lounge area and coffee bar are great to just meet up with friends, the indoor pool is really nice with windows surrounding it even on the roof, the pavilion outside with tables and chairs is a nice spot where you can bring your own picnic, the community garden has really taken off and the fitness center is the most beautiful gym I've ever used. There are lots of social events like movie nights and picnics and happy hours. We love it here! 55places.com is not affiliated with the developer(s) or homeowners association of Symphony Village. The information you submit is distributed to a 55places.com Partner Agent, who is a licensed real estate agent. The information regarding Symphony Village has not been verified or approved by the developer or homeowners association. Please verify all information prior to purchasing. 55places.com is not responsible for any errors regarding the information displayed on this website.